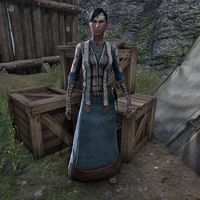 Odette Vinielle is a Breton member of the Mages Guild found at their camp located in the Glenumbra Moors. "My brother was almost killed by one of Faolchu's werewolves. I couldn't bear losing him, and I don't want anyone else to suffer such pain. That's why I'm here. We'll find a way to stop Faolchu." This page was last modified on 18 October 2017, at 03:35.